Milanés is open for lunch Tuesday through Sunday from 11 a.m. to 3 p.m. at 560 Embarcadro in Morro Bay. For more information, go to milanescubanfood.com or call (805) 772-2500. For Jorge Milanes, there is overwhelming comfort in the scent of Cuban spices simmering over a hot stove. Like a hand-woven blanket, the warmth pulls him back to the peeling paint and classic cars of Havana. He was just 3 years old when his family left Cuba for Miami. The year was 1958, and the Batista regime had routinely shut down the universities. CRAVING CUBAN Thai Bounty will continue to serve up lunch and dinner at 560 Embarcadero in Morro Bay. Now, thanks to owner Jorge Milanes' new co-venture located in the same restaurant, you'll also be able to grab an authentic Cuban lunch Tuesday through Sunday 11 a.m. to 3 p.m.
For a few years prior, Milanes' parents—both medical students—would fly to Miami for school (it cost about $20 back then for a round-trip ticket). Milanes remained in Havana, soaking up the sights, sounds, and smells. A year after the entire family officially relocated to the U.S., the Cuban Revolution changed everything. Young Milanes' world had changed, too, as new sights, sounds, and smells emerged. "When I would throw a tantrum at 4 years old, or say I was running away with my blanket, I'd always tell my mom, 'I'm going back home to Cuba!'" Milanes recalls with a laugh. "I always felt that strong connection, even though it would be about 40 years before my return." Milanes raised four kids and spent three decades in Calistoga, California. Between 1999 and 2008, he traveled extensively, especially to his homeland. He later settled in Los Osos, where he worked on the engineering team for the Los Osos Wastewater Project. 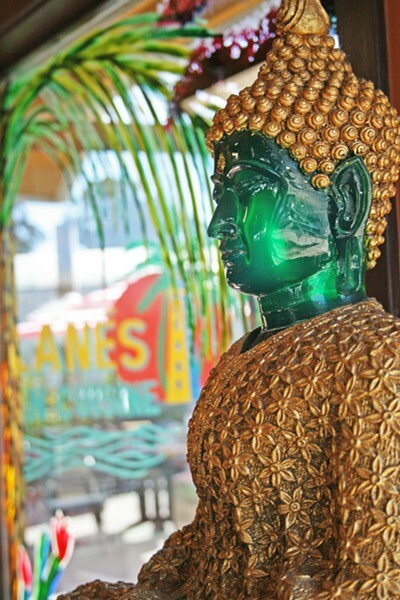 In 2009, Milanes opened up Thai Bounty in Morro Bay (Thai and Cuban are Milanes' two favorite foods, and Thai seemed most accessible). "I thought I would take an early retirement," he says, but we both know that's not what happened. The restaurant exploded with popularity and remains a tried-and-true local favorite. 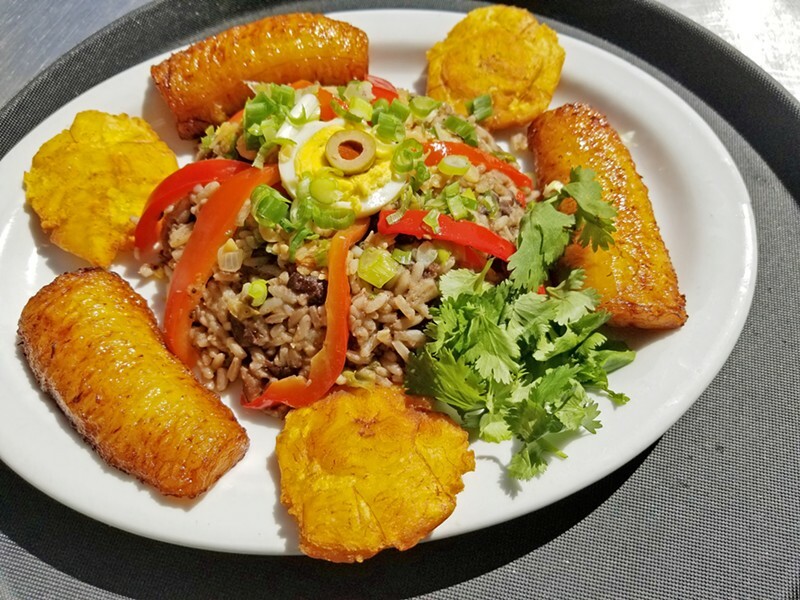 CRAVING CUBAN Ripe sweet plantains, savory black beans, seasoned rice, and pork or chicken spiced with onions, garlic, bell pepper, Spanish olives, and raisins make for authentic Cuban flavors by the sea. Milanés opened at Thai Bounty on the Morro Bay Embarcadero earlier this year, and is currently serving up both cultures. Thai Bounty is still doing its thing at 560 Embarcadero, churning out all the lemongrass-tinged dishes you've come to know and love. The only difference is that now you'll also smell Cuban flavors wafting in from the Thai Bounty kitchen, especially between the hours of 11 a.m. and 3 p.m., Tuesday through Sunday. I asked the chef what brought him back to Cuban food, after such a long love affair with Thai. "It can all be summed up with the sofrito: garlic, black pepper, cumin, oregano, paprika is nice. Then there's the mojo: lemon juice, spices; garlic of course. So good, warm or cold," he says. "I have such a high level of respect for what Thai Bounty has become, and we have a big Thai community here. I was always 'the Cuban that owned the Thai restaurant.'" The chef said that, at a certain point, he didn't feel the need to taste every sauce coming out; Thai Bounty had become a well-oiled machine. "The restaurant was solid, and I was able to do what I had always wanted to do, the Cuban food," he says. 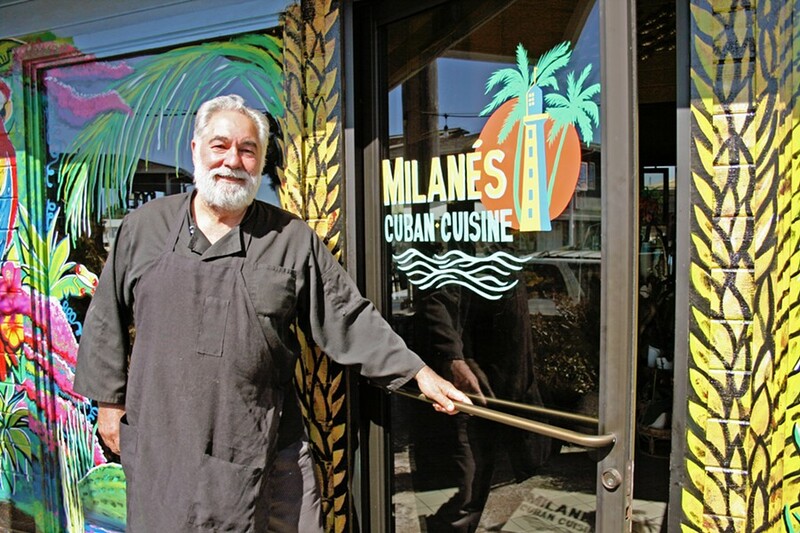 Although there are fewer Cuban folks in SLO County than, say, Miami, Milanes says he's met about three dozen living in the area (as you might expect, they all have strong opinions on his authentic entrees, which include picadillo, lechon asado, and arroz con pollo). Since opening earlier this year, the chef has also seen a surge of interest from more typical "ranch beans and tri-tip" set. "Central Coast people absolutely love our Cuban sandwich," he says, adding that he even added avocado to it during the recent Morro Bay Avocado and Margarita Fest. The beast of a lunch includes roast pork con mojo, ham, Swiss cheese, sliced dill pickle, and mustard all pressed panini-style and served with yucca chips. If the Thai food hasn't already drawn you in, this sandwich probably will. But how will you know you're in the right place? Enter the front door, and you'll see frogs, a crocodile, and parrots emblazoned across the glass. Inside, you'll see a stoic Buddha shrine in the corner. Listen and you'll hear the Cuban music (which is only momentarily disconcerting). "When it comes to pairing, I love to pair the music with the Cuban flavors; the beer and wine? That stuff will soon follow," the chef says, adding that his main goal is always to welcome new folks into the culture to experience a well-rounded taste of that hard-to-describe Cuban color. 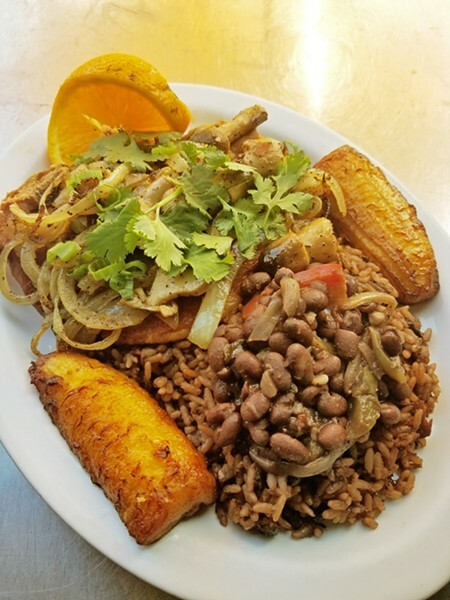 You can find it in the black beans, the sweet fried platanos, and cassava root sautéed in toasted garlic. Now, Milanes truly has come home, although what that means for everyone—and certainly for him—is complicated. Hayley Thomas Cain wants to go to Cuba. She can be reached at hthomas@newtimesslo.com.